RV Tire Safety: What temperature for CIP "cold inflation pressure? What temperature for CIP "cold inflation pressure? I occasionally see posts on the need to do an adjustment of your Cold Inflation Pressure ( CIP )when the temperature is not at some "standard". Many times the "standard" is stated to be 70F or 68F. Neither of these are correct. From a tire design standpoint CIP means when a tire has not been warmed up either by being in direct Sunlight or from having been run. We are not talking about some chemistry lab experiment but real life. This is defined by the Tire & Rim Association, the organization that published the standards book for tire dimensions and recommended Load & Inflation for all kinds of tires, wheels and valves. These standards are primarily intended to provide "interchangeability" as we want to be sure that every 15" tire fits properly on a 15" wheel of the appropriate type. Or that the valve will properly seal against air leaks by having the hole in the wheel of the correct diameter. 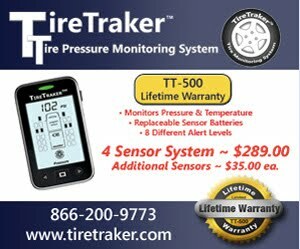 Now you don't have to get all wound up with temperature probes or IR guns to confirm a tire has not been warmed up. Just follow the guideline that when checking or adjusting tire pressure to your CIP, the tire should not have been driven more than 2 miles in the previous 2 hours, AND that the tire has not been in direct sunlight or otherwise artificially warmed up in the previous 2 hours. "Cold" really means when the tire is at the temperature of the surrounding air or what is called "Ambient" temperature. So unless you are taking your RV to the Antarctic or to the Sahara desert you can use the above as a simple guideline. Even if I were planning a trip from the top of Pikes Peak to Phoenix in a single one day drive I would not worry about making adjustments based on expected temperature. Tires are designed to have a large tolerance for pressure increase due to variations in the surrounding temperature. Remember the rule of thumb is that tire pressure will only change about 2% for every change of 10F so even going from 30F to 100F might only result in a pressure change of 14%. Now you would probably need to adjust the CIP the next morning before setting out but again you would set the CIP when the tire is in the shade and not driven on for a couple of hours. While this is probably good advice, I'm sure virtually no one is doing a tire pressure check everyday based on temperature or altitude changes. As a retired OTR trucker, I DO do a tire 'thump' check every time we stop for a break, and of course before setting out in the morning. You CAN detect slight changes in the sound of your tires, which indicates differences in pressure. While people may not do a tire check because of temperature changes every day some choose to confirm no air leaks with a check each travel day. Now a better method is constant monitoring with TPMS. I am glad you were in the top 5% that could "thump" tires and get the inflation pressure correct to within 10 psi but when controlled tests are run most people can't detect a 20 psi loss. On topic for tires, but not necessarily CIP, did I read somewhere that metal, instead of rubber, valve stems should be used beyond a certain tire pressure? My 5th wheel tires are 85 CIP but have rubber stems. Tks for the answer. Yes metal valve stems would be my preference. Standard rubber "snap-in" rubber valves as on passenger cars, are rated 65 pis max. While there are some with higher rating they still may not tolerate the added weight of a TOM sensor.